By now, many consumers are aware of the differences between central and micro inverters. However, did you realize that there's a third option that balances the benefits of both technologies? If you're looking for a middle ground, solar optimizers may be right for you. Solar panels produce power at a relatively low voltage, but inverters require a high voltage to perform DC to AC conversions. In order to produce power at this high voltage, panels must be wired together in series. This has the unfortunate side-effect of creating a "Christmas light" effect: when one panel is underperforming, the whole array is underperforming. Micro inverters solve this problem by simply converting DC to AC at each panel. Using MPPT technology, micro inverters are also able to squeeze the most out of each individual panel in an array. Efficiency in optimal conditions (south facing rooftops with no shading issues) is slightly lower than that of central inverters and cost is higher; however, panels can be wired in parallel and monitored individually so trouble spots are visible immediately. This makes them a superior choice for systems where panels are mismatched or partially shaded. Power optimizers take a largely similar approach. An optimizer is a small DC to DC converter that is attached to each panel in an array like a micro inverter. The panels are then wired in parallel. Using MPPT technology, the power optimizer then increases the voltage of each panel to the high voltage level required by a central inverter without the disadvantages of connecting the panels in series. AC to DC conversion is then performed at a central inverter. By keeping the most expensive part of the system centralized, overall system cost is lower than a micro inverter system. MPPT optimization on each panel means that panels can be monitored individually and problem spots easily identified. 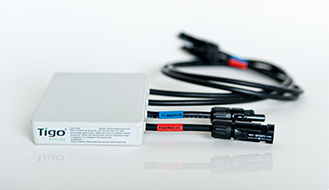 As with micro inverters, systems are easy to grow and panels can be mismatched without causing performance issues. However, because power optimizers still rely on a central inverter to perform the DC to AC conversion, how much you can grow your system without investing in a second inverter depends on the size of your original central inverter. Right now, EcoDirect has two different types of solar optimizers available: those that are compatible only with a matching inverter, and those that are compatible with any inverter that meets their specifications. SolarEdge's line of optimizers take the first approach. While the optimizers can be paired with third-party inverters, an extra piece of equipment is required as a go-between. The inverters, on the other hand, only work in conjunction with the optimizers. The benefit of this approach is that there really is no repeated technology between the optimizers and inverter because they are two halves of a whole, so costs are kept to an absolute minimum. On the downside, with this setup you cannot simply throw optimizers on a pre-existing array and call it done. You would need to invest in either the company’s proprietary inverter or the extra piece of equipment. Tigo's solar maximizers can be paired with a wide variety of inverters. While there may be some crossover between the inverter and the maximizers that can lead to higher costs than for a system like SolarEdge’s (for instance, an inverter with MPPT functionality that is already handled by the maximizers), this is a great choice for a low-cost addition to an existing array that already has another brand’s inverter. Remember, the best choice for your solar array depends on your particular situation. Roof direction, shading, desire for future growth are just some of the factors that you will need to consider when choosing a solution for your array’s DC-AC conversion needs. Micro inverters, central inverters, and component systems all have their benefits and disadvantages. Gaining an awareness of them is the first step to getting the most out of a solar system.